The Catholic Archbishop of Lagos, Most Rev. Adewale Martins and Governor of Central Bank of Nigeria (CBN), Mr. Godwin Emefiele at the weekend acknowledged the delivery of quality education by Catholic schools in the Archdiocese of Lagos. Archbishop Martins and Mr. Emefiele stated this at the Golden Jubilee celebration of Maryland Comprehensive Secondary School (MCSS), Lagos. Some projects including the new Chapel and multipurpose building were blessed and commissioned by the Archbishop. Among the dignitaries that graced the celebration includes Anthony Cardinal Okogie, Bishop Jude Arogundade, Bishop from Ondo Diocese, Governor of Central Bank of Nigeria (CBN), Mr. Godwin Emefiele, governorship candidate of Peoples Democratic Party (PDP) in Lagos, Mr. Jimi Agbaje, Provisioncial Superior, Sisters of Our Lady of Apostles, Nigeria Province, Sister Assumpta Mordi, Dean, Maryland Deanery, PTA chairman, Chief James Olorogun,Very Rev. Fr. Anthony Fadiro, several reverend fathers and sisters as well as old students. Martins in his homily, after Mass acknowledged the contributions of Catholic schools in the Archdiocese in the provision of quality education and that the results are evident in the crop of products churned out. The Catholic Archbishop warned that there must be zero tolerance for examination malpractice, drug abuse and bullying of students in all the Catholic schools in Lagos. Said he: ‘’Our gathering is to thank God for the successes recorded in the 50 years of MCSS. The quality of the achievements can be seen in the products. Golden jubilee is a significance milestone. It is worthy of the name, golden jubilee because of the products it has produced. The Archbishop further stressed that the Church is helping to provide quality education, noting that the Catholic schools have better facilities to enhance learning under a conducive environment even as he appreciated the old students for their support in improving the facilities in MCSS. He commended the former Lagos State Governor, Senator Bola Tinubu for returning missionary schools in 2001 despite the opposition by some interested persons and also stressed the need to partner with government to provide quality education. The proprietor of Catholic schools in Lagos revealed how Cardinal Anthony Okogie and others mounted pressure on the Lagos state government to return missionary schools to Churches and lauded those who assisted to rebuild the school after it was handed back to the Church. The CBN governor, Mr. Emefiele, an old student of MCSS, said with quality of education provided by the school, parents do not need to send their wards abroad and stated that MCSS has one of the best educational facilities. Emefiele, who graduated in 1978, told the Archbishop that he can still remember his class and praised the Catholic Church for establishing schools to provide quality education and commended former governor of Lagos State, Senator Tinubu for handing over the school to the Church. The school administrator, Fr. Sister Agnes Adepoju described the occasion as 50 years of active and unbroken service of nurturing young generation of Nigeria and commended Archbishop Martins, the CBN, Zenith Bank and MCSS Alumni Association for their support in ensuring the completion of the projects. Sister Agnes also lauded Cardinal Anthony Okogie for his fight that ensured the return of the school to the Church and commended the OLA Sisters, Nigeria Province for establishing the school on January 21, 1969 which has produced prominent Nigerians in different fields of endeavour. ‘’The 50 years golden jubilee of MCSS is a story of amazing grace. Our focus at MCSS is for the growth of our nation and adding values to the young ones through the provision of quality education. In his congratulatory message, Asiwaju Bola Tinubu said 50 years of MCSS is an important milestone and that he is proud to be part of the celebration. He acknowledged the award bestowed on him for his contribution to the journey of the school. Tinubu also felicitated with the CBN governor, Mr. Emefiele as an old student of MCSS and wished the school greater educational strides in the years ahead. 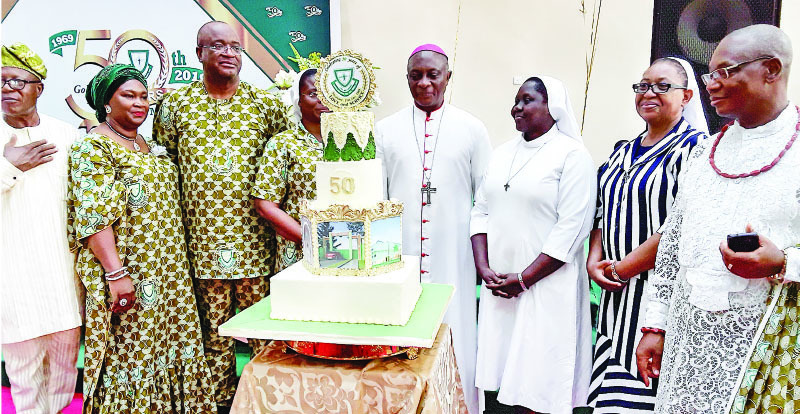 Okogie in his message said golden jubilee of any school is a proof that such institution has stood the test of time and reached a certain maturity wherein future growth is guaranteed.